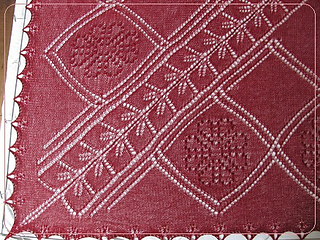 A digital booklet with 3 designs for shawls with hearts. Hearts are lining a very open mesh pattern. With a subtle pointed edging it is a long shawl you can wear at any time. Hearts are formed by knitting cute little nupps or glossy beads. With a leaf centre pattern and a nice edging of beads or nupps and this shawl becomes a dream to wear. This shawl is a bit special; you only knit a quarter and end up with a semi circular shawl. This construction allows for the knitted hearts to be aligned when you wear it for that special occasion. The mesh pattern is delicate and light. 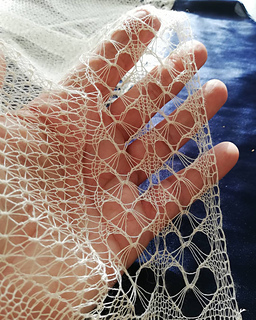 A nice challenge for the experienced lace-knitter.